If wireless charging is to become more than a bespoke curiosity, vehicle manufacturers will have to get involved. In 2018, two carmakers will start fitting as they are being assembled. A firm in Massachusetts has licensed its design to Toyota. Audi, BMW, Daimler, Ford, Jaguar, Mercedes-Benz and Volvo are expected to launch remote-charging-ready vehicles. For induction to work, the vehicle does not need to be stationary. The next step will be charging vehicles on the move. A wise driver keeps an eye on the fuel gauge, to make timely stops at filling stations. For drivers of electric cars, though, those stations are few and far between. The infrastructure needed for refilling batteries has yet to be developed, and the technology which that infrastructure will use is still up for grabs. Most electric cars are fitted with plugs. But plugs and their associated cables and charging points bring problems. The cables are trip hazards. The charging points add to street clutter. And the copper wire involved is an invitation to thieves. Many engineers would therefore like to develop a second way of charging electric vehicles — one that is wireless and can thus be buried underground. Electrical induction, the underlying principle behind wireless charging, was discovered by Michael Faraday in 1831, and is widely used in things such as electric motors and generators. Faraday observed that moving a conductor through a magnetic field induced a current in that conductor. Subsequent investigations showed that this also works if the conductor is stationary and the magnetic field is moving. Since electric currents generate magnetic fields, and if the current alternates so does the field, an alternating current creates a field that is continuously moving. This means that running such a current through a conductor will induce a similar current in another, nearby, conductor. That induced current can then be used for whatever purpose an engineer chooses. For wireless charging to work, a car must necessarily be fitted with a pickup. At the moment, this is a do-it-yourself business. Evatran, a Virginian firm, for example, sells kits of pickup and pad for between $2,500 and $4,000, installation included. According to Rebecca Hough, the firm’s boss, about 11% of the input power is lost during wireless charging with Evatran’s equipment. But plugging in a cord charger, she says, involves similar losses. The absence in cord charging of the air gap involved in wireless charging means cord charging requires a special (and power-draining) transformer to protect against surges. Evatran is not alone in the DIY induction business. HEVO, a company based in New York, will install a pickup for $3,000. HEVO also wants to take charging out of the home garage, by building networks of pads in cities. These, it intends, will be reserved and rented by drivers using their mobile phones. If wireless charging is to become more than a bespoke curiosity, though, vehicle manufacturers will have to get involved as well. This is starting to happen. Evatran says that, next year [in 2018], at least two carmakers will start fitting its pickups to their products as they are being assembled. WiTricity, a firm in Massachusetts that, like Evatran, designs both pickups and pads, has licensed its pickup design to Toyota, and also to two car-components companies, TDK of Japan and Delphi of Britain. Other carmakers, including Audi, BMW, Daimler, Ford, Jaguar, Mercedes-Benz and Volvo, are likewise expected to launch remote-charging-ready vehicles soon. And wireless charging is especially promising for buses, says Andrew Daga, the boss of Momentum Dynamics, a firm in Pennsylvania that sells more of its charging units for buses than for cars. A big obstacle to the uptake of electric buses is the need to take them out of service for part of the day to recharge them. If, thanks to wireless charging, such a bus can sip enough power en route to keep it chugging along until it can be given a charge overnight, it can at last, he says, compete with the diesel sort. The equipment used in Milton Keynes, which is made by IPT Technology, a German firm, costs about £100,000 ($130,000) a pad. But the buses’ operator, eFIS, calculates that one of their vehicles costs 50 cents a kilometre less to run than a diesel one, thanks to savings on fuel and engine repair. Collectively, Line 7’s eight electric buses drive 700,000km a year. According to John Miles, eFIS’s boss, the firm expects to start servicing a second route in Milton Keynes soon, adding two more charging pads and 11 electric buses to the town’s public-transport network. Wirelessly charged buses also run in Mannheim, Germany, in Utrecht, in the Netherlands, and in the Italian cities of Genoa and Turin, as well as in Salt Lake City and the Californian cities of Lancaster, Long Beach, Monterey, Palmdale and Walnut Creek. Los Angeles is expected to join the list next year. All of these efforts, though, still depend on a vehicle stopping when it needs to recharge. In that sense, wireless charging is no different from the plug-in variety. But things do not have to be that way. For induction to work, the vehicle does not need to be stationary. The next step will be charging vehicles on the move. Preliminary trials have started. One such is at a 100-metre electrified test track in Versailles, near Paris. This test, run by VEDECOM, a government transport-research institute, should be finished next year, but initial results are promising. The batteries of two minivans travelling simultaneously along the track at more than 100kph can successfully absorb 20 kilowatts each. Qualcomm, the firm that makes the equipment being tested, known as Halo, says it has already licensed the technology involved to 13 car-parts firms. One market the firm thinks promising is electrifying taxi ranks. As Graeme Davison, who is in charge of marketing Halo, observes, “no taxi driver on God’s earth” will keep getting out of his cab to swap charging flexes as the queue at the rank creeps forward. Israel is also interested in charging vehicles on the move. 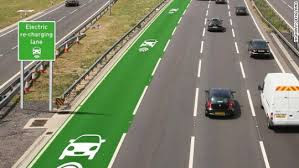 Shay Soffer, the chief scientist at the country’s transport ministry, has overseen the electrification of a short stretch of road in Tel Aviv, where tests will begin next year. He does not think electrifying roadways will be unworkably expensive. Oren Ezer of ElectRoad, the firm that converted the road in question, reckons a small crew, working three night shifts, could convert a kilometre of tarmac in this way. A lead vehicle would cut trenching into the existing surface and sweep up debris. A second, piled with electrical kit, would follow, with workers tucking the equipment into place in the trench as it travelled. A third would then fill the trench with fresh asphalt.